Becoming a Foster Parent | Our Experience - It's Gravy, Baby! On January 5, 2017, Justin and I were provisionally licensed as foster parents. A few hours later, 2 teens walked through our front door with their belongings in trash bags. Becoming a foster parent usually takes a much different route. To make a long story short, we knew the teens who walked through our door that night. They were our neighbors who had entered foster care one month earlier. We immediately decided we would do whatever it took to help them and that meant becoming foster parents. Once provisionally licensed, we had 6 months to complete all of our paperwork and training. I should begin by stating our county department of human resources licensed us. Agencies are another licensing option. Everything in this post is based on my experience becoming a foster parent. Policies differ depending upon your county, state, agency, etc. For more information on becoming a foster parent, please contact your local DHR office or foster care agency. Licensing required 10 3 hour classes, a water safety course, CPR class, and a prudent parenting course. The training hours alone can be overwhelming especially if you have a family and a demanding life. We had to find childcare on a week-night while making sure Bryson made it to baseball practice. Justin left work early on those days which was okay for us because he owns his business. Topics covered in our training included: foster care laws, adoption, grief and losses, trauma, abilities required, building attachments, discipline and punishment, reunification, disruptions, supporting the biological family, and more. You need to be a sponge! Our fellow foster parents in training were entertaining, outgoing, and interactive for the most part which made class interesting. Class was fun with our group, but it was mentally exhausting and heartbreaking as well. Our very last class, 2 little girls walked by the door. They had just been picked up and DHR was looking for placement for them. I will never forget the look on their faces as they walked the halls of the department of human resources at 8PM waiting to go to a stranger’s home. The homestudy seems to be the most dreaded and intimidating part of becoming a foster parent. Our requirements were basic, in my opinion. It’s beneficial to understand the purpose of the first homestudy isn’t for you to immediately pass. The first homestudy is to get to know you. A worker will walk through your home noting anything that needs updated, repaired, or any items required you may not already own. We needed electrical outlet covers, a larger fire extinguisher, and a lock-box for medications. One quick trip to Walmart remedied all of that. Other things to keep in mind: smoke detectors, guns and ammos locked away separately, and water heater temperature. After the first homestudy, you will receive a list of things you need to do in order to “pass” your next homestudy. It’s not nearly as intimidating as it sounds! Here is a list I found online that shows state-by-state homestudy requirements and minimum standards for foster homes. I will add an updated list if found. From the moment you sign up to become a foster parent until the moment you close your home, you will be inundated with paperwork. The licensing worker understandably needs to know everything about your life. From your relationship with family members to your medical history and finances, you need to be an open book. You will also have to complete worksheets and class homework. We were required to write a letter to our future foster child as well as their birth parents. In addition, each foster parent wrote a mandatory autobiography. A criminal background check and fingerprinting is part of the process. Proof of home and auto insurance as well as proof of rabies vaccines for your pets are a couple of other things required. Because we were provisionally licensed, medical clearances for our entire family were required within 2 weeks. Fortunately our children had recently had their check-ups. I simply dropped off forms with their pediatrician. Justin and I both had to have physicals. Another requirement for everyone was TB tests. That was definitely not fun for our little kids. They inject a small amount of TB under the top layer of skin on your inner forearm. 2 or 3 days later, you return to the doctor to see if you’ve had a reaction. It’s no secret that I live with depression and anxiety. Many people fear becoming a foster parent because of judgement or denial based on mental health issues. My mental health issues are well controlled by daily medication which my physician noted on my physical. I am very open and honest about my depression and anxiety. I never tried to hide it. Personally I feel like my struggles help me be a better, more compassionate parent. There are a million reasons to say no to becoming a foster parent. It isn’t easy and the requirements are plenty. But there are so many more reasons to say yes. If you’ve read this far, please consider contacting your local DHR or foster care agency. Foster homes are badly needed all over. Kids need someone to love them and support them during what is such an uncertain time in their lives. Biological families need foster parents who will root for them! You don’t have to be a perfect parent or have the perfect home and family. I don’t know how it works elsewhere, but here you are welcome to attend classes to see if foster parenting is for you. There is no obligation to become a foster parent. I’ve only scratched the surface in this post. The best way to learn more is to talk to other foster parents in your area. I don’t think foster parenting is what everyone assumes it is. Yes, there are court dates and a lot of meetings and paperwork but there is also just every day life with kids who need stability. 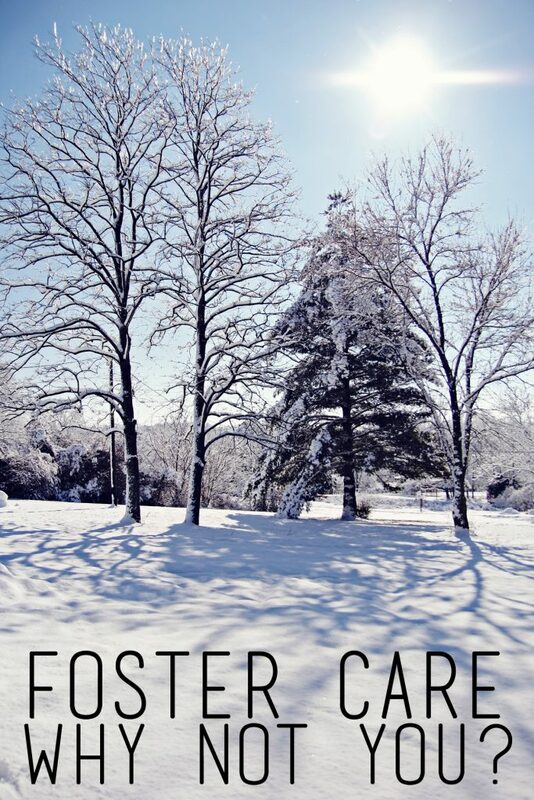 Foster care has no doubt changed my life, but my every day life has stayed the same for the most part. I just have a few more kids to love and care for now.